Composed by Peter Ilyich Tchaikovsky (1840-1893). Edited by Maurice Hinson. Masterworks; Piano Collection. Alfred Masterwork Edition. Form: Suite. Classical Period and Christmas. Collection. With standard notation and introductory text (does not include words to the songs). 48 pages. Alfred Music #00-4856. Published by Alfred Music (AP.4856). ISBN 0739006754. 9x12 inches. English. Each volume includes eight movements chosen and arranged for piano solo or 1 piano/4 hands by Tchaikovsky himself in 1891, adapted from his orchestral ballet. 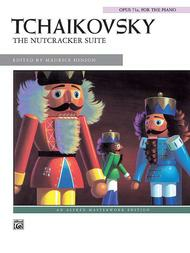 To assist pianists in creating a memorable performance, editorial notes are offered by Dr. Hinson and the story of The Nutcracker is provided as an introduction. to discover that both scores matched very well, although I annotated this newer edition to acknowledge some extremely minor differences. It is nice to have a new, fresh copy of the score! I enjoy it. Book arrived on time and in perfect condition. It contains good piano arrangements of the Nutcracker suite that are challenging, but not impossibly hard. Overall a great piano version of the Nutcracker Suite with good edit suggestions as well. This collection contains the seven movements from this ballet. They are arranged for solo piano, and all the harmonies are complete and full. the best of the buisness! !